What did a tourist visiting Toronto do in the 1870s? Complain about the heat... and tour Osgoode Hall. When Montreal lawyer John Monk visited Toronto in early June 1879, he wrote a letter home to his wife using the writing paper that the Queens Hotel, located where the Royal York Hotel now stands, conveniently provided its guests. The letter, a copy of which survives in the Law Society's archives, begins: My dear Eliza, We arrived here after a very pleasant, but, except in the mornings and evenings, a very hot journey. The two hours we passed in Kingston, yesterday, were, without exception, the hottest I ever experienced." After describing the boat trip from Montreal and outlining plans for the rest of his business trip to the United States, Monk went on to "tell you what we have been doing today." 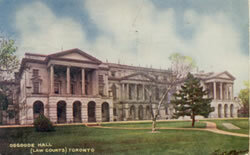 After briefly visiting friends, Monk toured the sights of the city: "first to Osgoode Hall, which is a magnificent building. The Sheriff Jarvis, without any move on our part but solely of his own mere motion took us through the building, the Courts being in session, although not much doing; the library is a splendid room, in fact the building would do credit to any country and is vastly superior to Westminster Hall. The carving of the ceiling is simply superb. The grounds are simply beautiful; the trees in full bloom, the grounds neatly trimmed, the walks without a blemish." Monk and his companion then "wended our way to the University and grounds" and visited the Museum. Monk was very favourably impressed with Toronto: "Good taste every where pervades; The City looks like an English city, the buildings I think far surpass ours; the homes decidedly do, in fact you would be delighted." He did not hold out high hopes for the rest of his trip through Duluth, St. Paul's and Omaha and ending in San Francisco: "For some time you must not expect much from me as I am going to travel through a country which may not offer much scope for description." 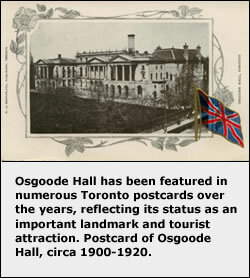 Osgoode Hall continues to attract visitors to this day. More than 7,500 people toured the building during Doors Open Toronto in each of the past two years. Summer tours are offered on non-holiday weekdays during July and August starting at 1:15 p.m. Building staff are still proud to show off their unique workplace: Law Society staff volunteer as tour guides, carrying on the tradition carried out by Sheriff Jarvis in 1879. And now, the building is air conditioned. 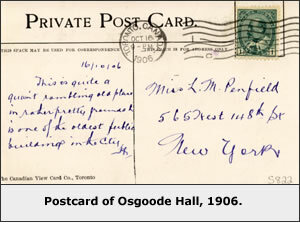 Postcards from The Law Society of Upper Canada Archives, Special Collections, S189 and S822.